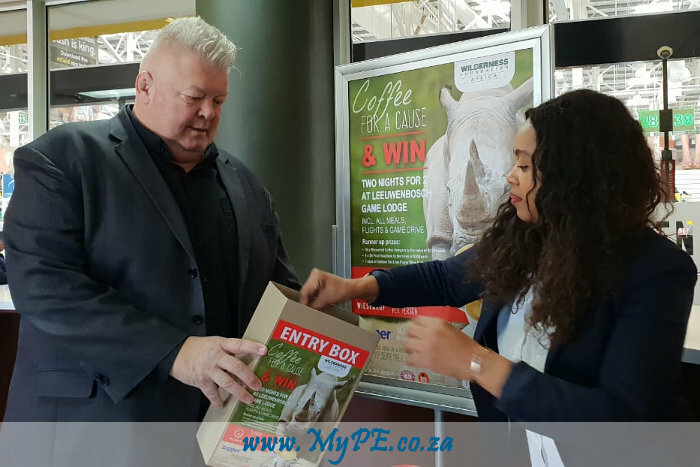 Kobus Wiese of Wiesenhof Coffee Holdings and Pinky Kondlo of Wilderness Foundation Africa did the draw at Wiesenhof Makro Cape Gate, Cape Town and Catherine Fraser of Dulce, together with Tania Plakanouris of Wilderness Foundation Africa did the draw at Dulce Walmer Park, Port Elizabeth. Alaweja Ellie, who entered at the Dulce Café situated inside Ahmed Kathrada Hospital in Lenasia, won a 2 night stay for two at Leeuwenbosch Country Lodge in the Amakhala Game Reserve in the Eastern Cape. Chanel von Staden, who entered at the Wiesenhof at Wilgers Hospital in Pretoria, won the same prize.